On a whim, last winter I ordered carrot seeds that came on a strip of paper. Carrot seeds are teeny, weeny, tiny and these came already stuck to a strip of biodegradable paper. Just plant the strip and you’re done. Yesterday, I harvested those carrots and had a good ol’ time. I dug them up, soaked them in water, found a sunny spot on the front porch out of the wind, cut the green tops off, rubbed them clean and bagged them up. Happy intensely watched my carrot harvesting and patiently waited for me to include him. That is one carrot plant he is holding. Or several that morphed together? Pretty soon, he started playing, swinging the plant up and down. I don’t believe he quite knew what to do with my alien carrots. Good thing we are both easily entertained. 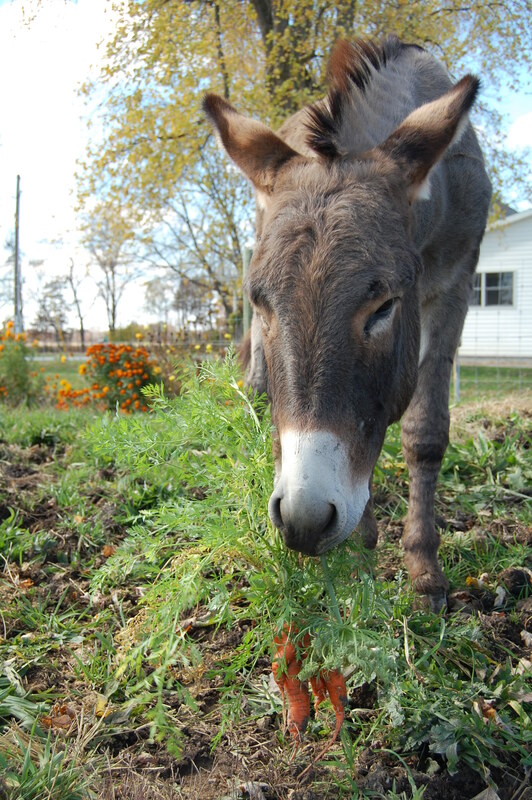 This entry was posted in Country Living, Happy the donkey and tagged Carrots, gardening, Happy the donkey. Bookmark the permalink. Our animals … we would be lonely without them! No cooked carrots for you! Happy is a day-brightener. Those pictures of Happy with the carrot plant are hilarious!!! So cute. Thanks for sharing your wonderful animals! You’re welcome! Happy loves the attention. We grew carrots one year. My daughter was impatient and would pull them when they were still small, brush the dirt off, and eat them straight out of the garden. I should have picked some of mine sooner! Nice! It’s funny how animals are. They make you stop and enjoy the moment. So true! They are definitely about living in the moment. 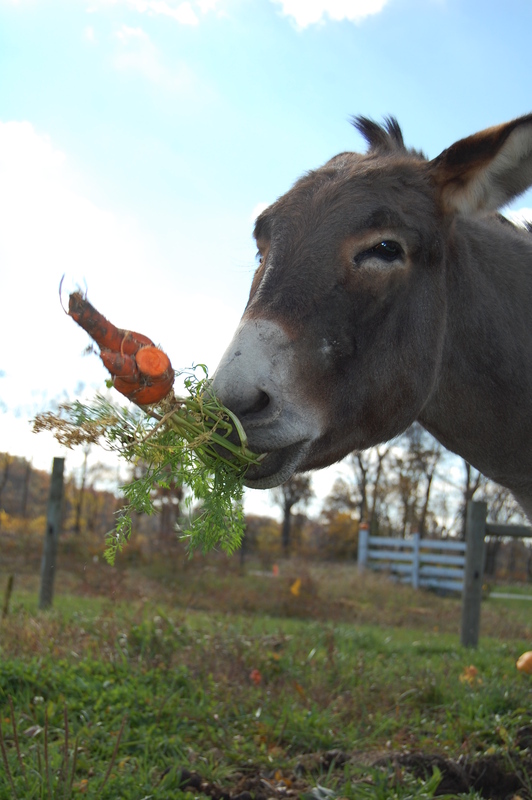 Cuteness–Happy with the carrots. The ones my dad grew were some odd-looking things, too, nothing like what we find at the store. The ones I have cooked with have tasted good, so far. 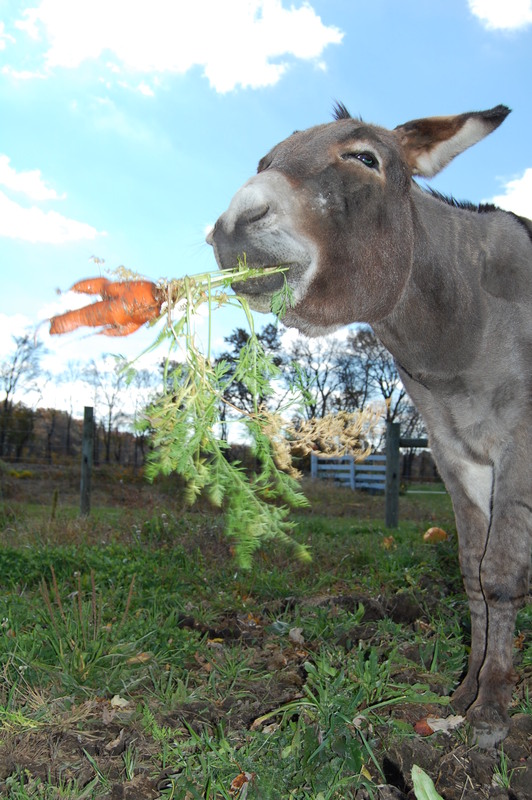 I love the donkey- great post! Did you till the soil first? I don’t know nuthin’ ’bout growin’ carrots but it seems to me that perfect carrots would need loose soil. I’ll bet they taste better than grocery store carrots, too!